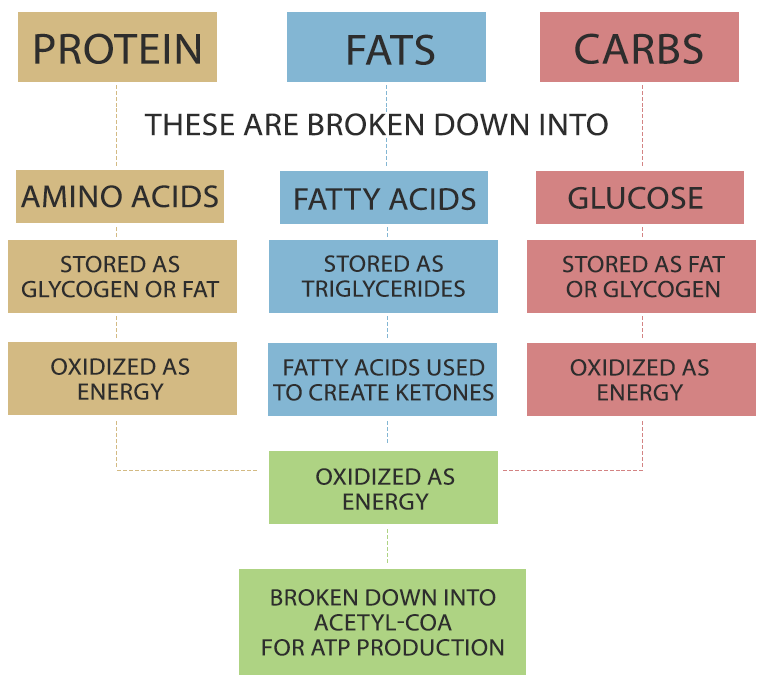 THE KETOGENIC DIET: A QUICK GUIDE. The ketogenic (keto) diet consists of eating HIGH FAT, MODERATE PROTEIN, VERY LOW CARB food. The ratio should generally be 75-80% of healthy fats, 15-20% of protein and 5-10% carbohdrates. As a guide, net carbs (total carbs minus fibre) consumption should be restricted to 10-30g a day. Any very low carb diet that forces your metabolism to deal with glucose starvation is termed Ketogenic. Paleo focuses on whole foods and rejects any processed or cultivated foods. However, the Paleo diet can only be termed ketogenic when starches and natural sugars are omitted. Atkins is a diet plan that begins with the ketogenic method until a fair amount of weight is lost. After this phase, however, carbs are slowly reintroduced. LCHF is just an acronym of Low Carb High Fat. LFHC is its opposite, meaning Low Fat High Carb (Standard Western Diet). Good fats are those from natural sources. Monounsaturated fats, saturated fats, polyunsaturated oils and MCTs are all great. You can find them in meat, fish, butter, cream, ghee, lard, eggs, avocado, coconut, extra virgin olive oil, nuts and seeds. Good fats can turn bad when heated to certain temperatures. Meat Fat (tallow), Ghee, Butter and Coconut Oil are best for high-heat cooking. Extra Virgin Olive Oil, Avocado Oil and Macadamia Oil are suitable for low-heat cooking. Other Vegetable/Seed/Nut Oils should not be heated at all. 1) URINE test. You can buy urine strips that are designed to specifically measure ketones. This method isn’t the most reliable, especially after the first few weeks of carb restriction. 3) BREATH test. This is my preferred method, although it requires a bit of an investment upfront as the tool isn’t cheap. On the plus side, it is easier and more convenient than the other test methods and you won’t need to keep restocking supplies. I use the Ketonix (U.S. option HERE). Once you become familiar with what to eat and how many carbs are in the food you eat, you won’t need to worry about constantly counting carbs, fats and protein. However, you won’t get to that point unless you’ve assessed your macros and determined your energy expenditure. There are various online calculators that predict your energy requirement (Kcals) and the ratio of carbs-fat-protein you should be aiming for. The KetoDietBuddy is an example. No, you don’t have to. But it may be wise. Especially at the beginning when you are trying to flip the table on high-carb low-fat. Most people lose weight on keto without counting calories, because keto makes them feel satiated more quickly and for longer periods of time, which leads to skipping meals and eating smaller portions. However, everyone’s different both in terms of metabolism and activity. Do whatever you feel comfortable with. Just don’t over-indulge, especially with keto-friendly treats that can add a lot of unnecessary calories. For example, cauliflower ‘rice’ can replace normal rice, eggs and courgettes can make a delicious pizza crust, there are low carb pasta options like black bean pasta(U.S. option HERE), zoodles (thin courgette strings) can replace noodles, you can make a delicious mash ‘potato’ with cauliflower. There are infinite possibilities and there is an enormous amount of help available. In any case, once your body becomes a keto, fat burning, mean machine, you’ll find that your food cravings minimise if not disappear altogether. However, you will probably find that, as you reap the benefits of keto and your overall health improves, you will start to question inferior ingredients and begin to lean more and more towards organic, better quality foods, which cost more. The vast majority of people can. However, certain metabolic dysfunctions and medical conditions preclude the ketogenic diet. Click here for a list kindly provided by ketogenic-diet-resource.com. If you’re in doubt, always discuss with your trusted medical advisor. Enjoyed this post? I value your feedback! Please don’t hesitate to leave me a comment with any questions or observations you might have. Very informative article. Fabulous tasty recipes and it’s great to be following a uk keto/lchf blogger, thank you. You’re very welcome Jane! And thank you for the lovely comment. Excellent article! Giving some guidelines for carbs intake, Awesome!